After rallying Tuesday on news that China had committed to investing $14.7bn in SA, the rand continued to trade stronger on Wednesday, strengthening by 0.4% at noon. The local currency opened at R13.28 to the greenback, and was trading at R13.23/$ at 12:27. 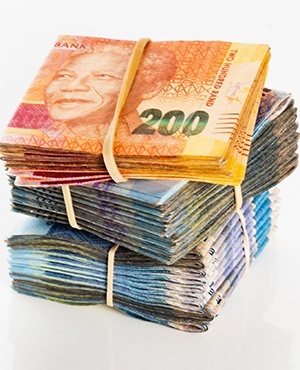 "[On Tuesday] the ZAR led emerging markets currencies (except the Turkish lira) stronger as China promised to invest nearly $15bn in South Africa,” said Adam Phillips of Umkhulu Consulting in a morning note. Cash-strapped power utility Eskom was also granted a $2.5bn loan by the China Development Bank, which will be used for the construction of Kusile power station. Wichard Cilliers, director and head of dealing at TreasuryONE, noted that discussions were also held between SA and China to try to rebalance trade between the two countries via the boosting of SA exports. "This (also) helped the ZAR trade stronger [on Tuesday]," he said. Analysts said that, with little local data set for release, the rand would again look to global markets, as well as developments at the Brics Summit in Johannesburg for direction on Wednesday. NKC African Research said in a morning note that it expected the local currency to trade betwen R13.05/$ and R13.35/$.